Is it difficult to add a spa while remodeling your swimming pool? 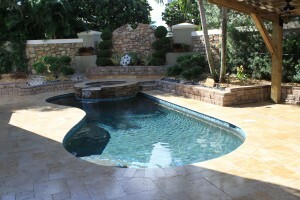 Treasure Pools and Services, Inc. specializes in swimming pool resurfacing. They have proven expertise in all aspects of pool remodeling from small, private backyard pools to large community and commercial installations. Whether you want to repair, rebuild, add a spa, update your deck, upgrade your equipment or simply recoat with one of our superior refinishing processes, we do it all! There are numerous options when it comes to remodeling and it really depends on what exactly you are looking for. Adding a new spa or hot tub is one route that many homeowners like to go and it is definitely something they do not regret! When considering to add a spa there are a few things that you need to keep in mind. First off, budget. Craig Cohen, owner of Treasure Pools, does his best to be able to provide top quality products and service at an affordable price. He also has a wonderful pay-as-you-go option for qualified homeowners. This consists of any initial small deposit to cover engineering and permit costs, then the remodeling is divided into three phases. At the successful completion and inspection of each phase, payment isn’t requested until the job is completed. Secondly, is how much space you have in your backyard. Do you have enough space for a spa or will you incorporate it into your already-existing pool design? Not to worry, Treasure Pools can complete a 3D rendering of what the completed project will look like with any addition in your own backyard. This is completely customizable and helps to give you a true sense of what the final product will look like. Also, safety is still top-of-mind for spas and Treasure Pools is updated regularly with all of the new codes and regulations. You can note from our previous post, The Association of Pool & Spa Safety’s (APSP) safety checklist that homeowners should reference to make ensure that each guest remains safe and has an enjoyable experience. Lastly, the addition of a spa or hot tub is really great for those nights that you just want to relax and unwind. They are also great at providing a more intimate setting. Come by our showroom today to learn more about incorporating a spa into your remodeling process!